(l-r): Outgoing chair Peter Roberts, vice chair and secretary Kaye Robinson, vice chair Jeremy Whitaker, chair Richard Burningham and ACoRP chief exec Jools Townsend. ACoRP is pleased to announce the appointment to their board of a new Chair and Vice Chairs. Interim chair Richard Burningham (Devon & Cornwall Rail Partnership), will be continuing in the position of Chair, taking over from Peter Roberts. 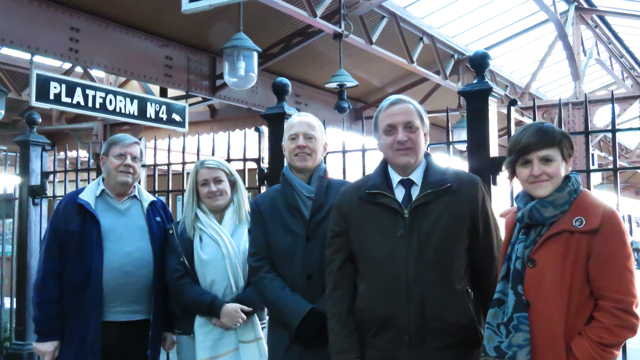 Two new Vice Chairs are Kaye Robinson (Poacher Line Community Rail Partnership) and Jeremy Whitaker (honorary member), taking over from Sheila Dee and Philip Ayers. Kaye has also been appointed to the position of Secretary. Kaye and Jeremy are recent additions to the ACoRP board, following the organisation’s AGM in December. ACoRP extends its thanks to Peter, Sheila and Philip for their valuable contributions to the board, and looks forward to working with Richard, Kaye and Jeremy in the future.